As Brexit looms, is this the last Christmas that retailers can avoid talking up price in ads? 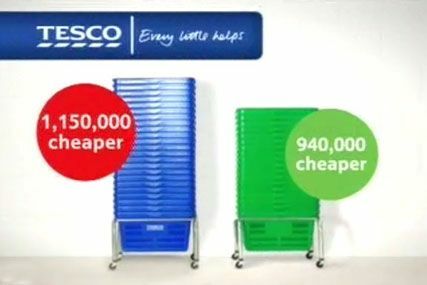 Asda's 2013 price comparison campaign. As uncertainty over Brexit's effect on consumer spending grows, supermarkets may be tempted into their old price comparison tricks. Grocery retailers have been working hard over the past year to stop talking about price in their marketing efforts and instead differentiate from the discounters by better articulating their brand values. But, looking to 2017, Tesco chief executive Dave Lewis has admitted this strategy may not be sustainable. Brexit negotiations are yet to start but already the impact of the UK’s decision to leave Europe has unsettled the financial markets and concern now lies in the long-term impact it will have on consumer spending. Despite these worries, this Christmas has been filled with fuzzy messages from the UK’s biggest grocery retailers who have all spent the last 18 months working hard to avoid talking directly about price in their advertising. But how long can this really go on? The chancellor’s Autumn Statement this week painted a mixed picture. A rise in the national living wage and an increase of the income tax threshold have been designed to put money in the pockets of working families. However, The Office for Budget Responsibility (OBR) predicted the fall in the value of the pound next year will add almost 2% to the level of consumer prices over the next two years. People, then, will keep seeking out value – a trend that hasn’t fully disappeared since the 2008 recession and one which contributed to the growth of discount supermarkets Aldi and Lidl. During this time, the Big Four supermarkets deluged the market with offers and price-cuts as they tried to stave off the threat of the discounters. Advertising, likewise, was filled with promises of lower prices. It wasn’t until years later - coupled with a scathing report from Which on the “bamboozling” tactics these beleaguered supermarkets had been using - that they all - in seeming unison - decided to stop talking about price and instead differentiate on brand values. But, the Institute for Fiscal Studies has now predicted that people will earn no more by 2021 than they did in 2008. So, with purse strings once again tightening could this Christmas be the last of the fuzzy ads? In Morrisons’ most recent above-the-line work, it pushed the moments that it can make special, a strategy that continued through to its Christmas campaign. But, following its third quarter results in September, analyst Phil Dorrell, partner at Retail Remedy, suggested that this will be the last cheap Christmas before prices are affected by inflationary pressure. And “so we expect price to play its role in the Morrisons marketing message,” he said at the time. Likewise, Tesco was sucked into the market norm of talking about how much it had invested into lowering prices to stay competitive with Aldi and Lidl. Last year, the brand boss Michelle McEttrick said it would no longer spend media money to advertise prices and would instead talk about qualities that make the retailer unique. However, facing what could arguably be the retailer’s most challenging year, chief executive Lewis told The Drum that a rethink might be in order. "Since I've been here we've not advertised price directly at all, especially in above-the-line. Interesting, the perception of our value has improved considerably over that time. Direct redemption and communicating that in-store is a much better way of communicating price. But we'll see if the dynamic changes as we go forward in relation to inflation," he said. "The market may change considerably in the next six months and we'll have to revisit it if that's the case." What could be a defining factor is how the conversations between FMCG companies, like Unilever and P&G, on the price of goods play out. ‘Marmitegate’ as it was dubbed shone a light on the battle between supermarket and food maker as the latter try to pass the rising cost of manufacturing goods on to the former. Some will fare better than others. Tesco rejected a 10% price hike Unilever proposed on its major brands, like Marmite, while Morrisons caved and agreed to a 12% increase. During the well-publicised negotiations, Asda ran a print campaign highlighting the cheaper price of the spead on its shelves. And while that tongue-in-cheek ad might be written off as a bit of tactical advertising it could also be the rumblings of a return to the advertising price-war. Grey Shopper managing director Rob Sellers, however, argues that it’s unlikely we’ll see the major grocery retailers suddenly revert to talking about price given that the ‘Brexit effect’ will be felt equally by all. “The consensus amongst most economists, retailers and producers is that the fall in value of the pound and Brexit are going to drive up the real cost of goods to families and invariably they will be more cost sensitive. But how you communicate that is all relative, because it’s the same for everyone else,” he said. So, even if price doesn’t return as the main creative lever through which strained retail bosses promote their brands there is still no doubt that in the coming year they will need to work harder to get cost conscious consumers through the door. One way Tesco et al might be able to keep their FMCG partners on side amid testy price negotiations is by investing more in experiential activity. As part of the radical crackdown on talking about price, they have also culled in-store promotions to help simplify the shopping experience. This has led to what Matt Hill, president for Europe at Kraft Heinz, described as “dull shelves that are reminiscent of libraries”. In the current economy, FMCG brands are battling to innovate and bring new products to market and when they do they need in-store marketing support a launch. P&G’s boss recently said that it would be investing heavily in in-store marketing and urged its retail partners to work with it on coming up with creative solutions to getting it in front of customers. Another avenue will be to create unique services that they can talk about in advertising, according to 18 Feet & Rising chief Jonathan Trimble who recently spoke at an event about Christmas advertising. And while his insights were based on what he’s noted over the festive period, they arguably carry weight to where things are heading for advertising all year round. Take Amazon, for example, whose festive output was emotional – featuring priest and an Imam - but at its heart promoted the simplicity of its app and speedy delivery.